Ever since I first had celery root pickles at the restaurant Taberna de Haro, celeriac has become my new favorite pickle! I have made many batches of pickled celeriac since, as a cook at Taberna de Haro last year and at home. Here I want to share with you my recipe to make celeriac refrigerator pickles, which was published in my town newspaper, the Lexington Minuteman, for the Lexington Farmers' Market. Celery root is in season right now, so it is the perfect time to make these pickles. There are a few more weeks left for the Lexington Farmers' Market for this season, or find celery root at another local farmers market near you. Celeriac, also known as celery root, was one of my favorite vegetables to weed at the farm last summer, no joke. Celery root contains plenty of fiber, as well as vitamin B6, vitamin K, potassium, phosphorous, and more. Although celeriac may be unfamiliar, there are many ways to cook this versatile vegetable. The leaves and stems of celeriac can be used just like celery. Celeriac can be eaten raw and grated into salads, or fermented. Celery root can also be cooked, such as in soup or roasted with other root vegetables. A celeriac puree is a great alternative to mashed potatoes. However, one of my favorite ways to prepare celeriac is to make celery root pickles. Celeriac is delicious pickled, although this pickling recipe can be used with other vegetables as well. 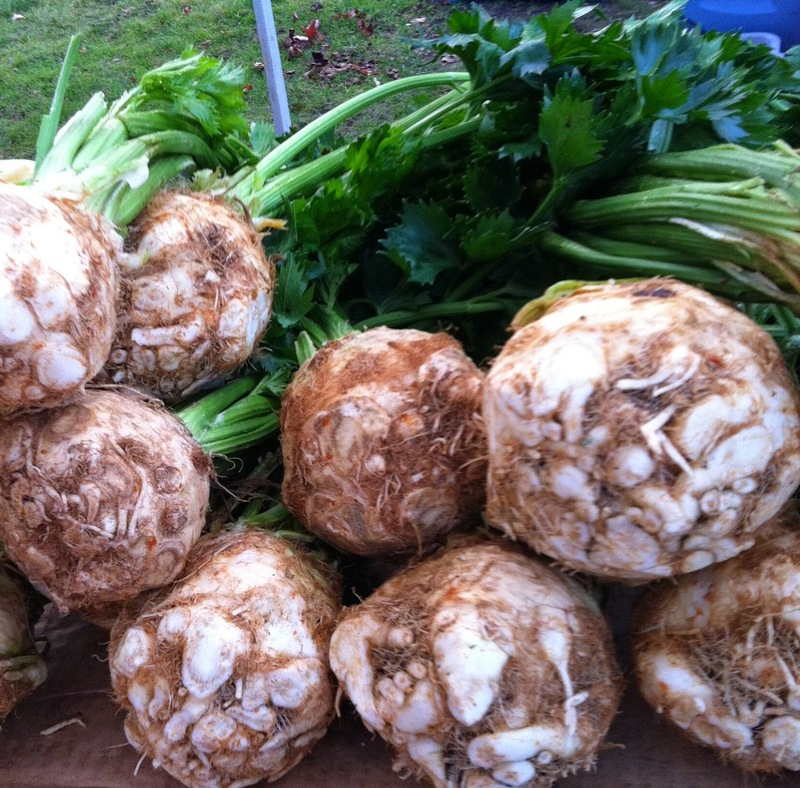 Look for celeriac at the Lexington Farmers' Market to arrive fresh from the farms in a week or so. Cut off the bottom and top of the celeriac. Peel the celery root and cut into thick matchsticks. Add all of the ingredients except for the celeriac in a pot. Bring the pickling brine to a boil. Add the celeriac and simmer it briefly for about 1 minute, according to taste. Do not simmer the celery root for too long, as it should still have some crunch. Take the pot off the heat and let cool to room temperature. Pour the vegetables and brine into glass jars. Cover the jars and refrigerate them. After 24 hours, eat and enjoy! The pickles can last for up to a few months in the fridge. Pickle celeriac with purple beets to give it a purple color. Use this pickling brine recipe with other vegetables, such as carrots, radishes, or turnips. Depending on which vegetables you use, how thin the vegetables are cut, and how crunchy you like your pickles, step 3 may be optional, and the raw vegetables can be added to the brine without being simmered. Switch up the spices in the mix. For example, dill, cinnamon, and star anise are all good candidates. Annabelle Ho is a Lexington resident with a Bachelor of Science in nutritional science from Boston University. She maintains a blog at herbalmedicinebox.com, and is a work share volunteer at Waltham Fields Community Farm. Annabelle writes for the Lexington Farmers' Market, and has been a volunteer at the market for several years. The Lexington Farmers' Market is located at the corners of Massachusetts Avenue and Fletcher in the center of Lexington, and is open rain or shine every Tuesday through October.